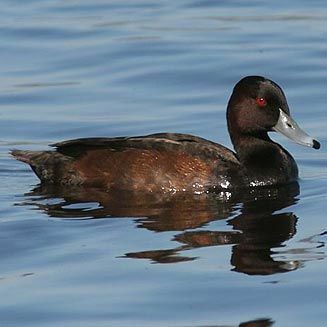 Southern Pochard have an overall appearance of black or dark brown. The red eye of the male is conspicuous and diagnostic as is the crescent-shaped ear covert of the female. In flight the wings reveal a distinctive light or white window. The bill of the male is blue-grey in colour and that of the female slate-grey, both black tipped. Southern Pochard appear to prefer deeper, inland waters and can be found on seasonal and permanent dams, pans and other deep waters such as sewage works. They also display a preference for clearer waters.